Reservation in India means that a certain percentage of seats are reserved for backward communities in areas like educational institutes, in departments of state and union governments, in state civil services, in public sector organizations etc. However, such reservations are not applied in educational institutions of linguistic and religious minorities. Now the question is, what are backward classes? Well, these are people who belong to classes like Scheduled Castes, Scheduled Tribes and OBCs or Other Backward Castes. Why is this reservation system in place? The Indian caste system has a shameful legacy. If we look far enough in our ancient past, we will notice that caste system was defined by the nature of work people did and not by their birth. This means that there was flexibility of changing castes simply by changing profession. However, over time, this profession-based caste system was translated into birth-based caste system. Over time, a person’s caste was determined by his or her birth and not by his or her profession. This is where all the problems popped in. Since people were no longer allowed to change profession and hence caste, social injustice crept in. The so-called higher caste people started suppressing people of the so-called lower caste and denied them of opportunities. This social bias became so deeply rooted in India’s social structure that the tradition for caste system continued for thousands of years and India is plagued by this evil even today. Post independence, Indian leaders realized that these oppressed people really did not represent India much in the process of building the nation. It was found that these oppressed people who were denied of all opportunities also failed to get proper education and remained economically stifled for thousands of years. It was necessary to uplift their economic conditions. The space for such social and economic oppression in independent India was not present. It would clearly defeat the very purpose of achieving independence. This is why reservation system was brought in and implemented. In 1950, the Constitution of India stated that SCs will have 12.5% reservation in government jobs and institutions and STs will have 5%. This was amended later in 1970 and the bar was raised to 15% for SCs and for STs it became 7.5%. Since, SCs and STs had their reservation quota, it happened that other castes also started demanding reservations and things quickly spiraled out of control. Eventually, Supreme Court passed a ruling where it was mandated that total reservations cannot ever exceed 50%. This mandate was necessary because if all minority communities were given reservation, the majorities or the upper class people would no longer get fair share of seats, which would be in rightful proportion to their total population. This is where things became bitter and conflicts based on reservations for castes came in. People started questioning the whole system of reservation in India. This led to partition among people. Some stated that reservation is needed and some said that reservation is not needed. Both groups have their fair share of arguments. Let us check it out. 1 People argue that reservations are important to maintain politics in India. Well, we will get to this later. Reservation system builds a wall and internally divides India by preventing inter-faith and inter-caste marriages. 2 Reservation system has managed to bring underprivileged people to the forefront and many have actually gone a long way to hold high positions all over the world. Merit based system is broken down by creating an inflation of credentials that are moderate. Education system should be merit based and not based on relaxed criteria for entry. 3 Reservation system, according to its supports, brings social justice to those people who have suffered for thousands of years and have been stripped off the basic human rights that everyone is entitled to. Reservation for castes only enforces the very notion of caste in Indian society. 4 Reservation has slowed down the process of forward people becoming richer and backward people becoming poorer. Reservations has become a tool to get political edge. It is not democratic politics, it is narrow politics. 5 If people do not have equal rights, the concept of merit itself becomes vague. Backward classes don’t get a chance to get educated and bringing in merit to judge them is a sick system. Instead of using reservation, government should try to get rid of problems like gender differences, economic conditions, caste etc. that prevent people from entering into education and jobs. 6 Those who support reservation do not see that fact that women have 33% reservation and that 33% quota should be inclusive of the caste based reservation for women. Why there has to be a different quota. However 33% reservation is in state legislatures and parliament then why such special consideration is not present in case of higher education? 7 A social audit has never been conducted for the reservation system. Only government officials and policy makers determine it. However, a public opinion should be used for the same. 8 There are poor people in forward caste community. Again there are rich people in backward caste community. Reservation system simply overlooks this. 9 Reservation policy has led to brain drain. Meritorious students are going to foreign countries for higher education. Now, talking of supporters of reservation in India, they argue that it is necessary for politics. However, it is a wrong argument. 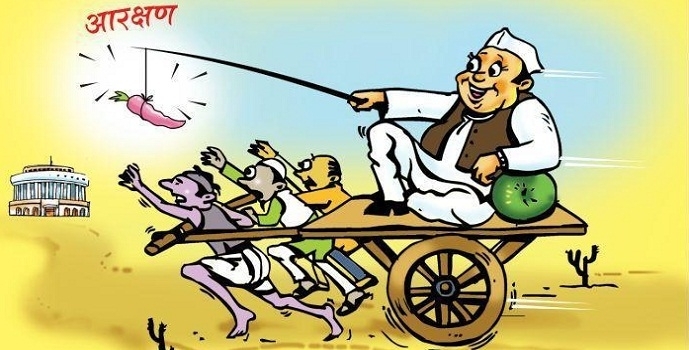 The narrow politics in India uses reservation and caste as a tool to achieve power. This is not good politics and harmful for India. Before we end, do you think India really needs a caste-based reservation system? Drop your thoughts in the comments section below. no caste based system should be removed but reservation is necessary we should 2revised our reservation system..actually every body want this but our young generation are so much busy that they not even vote so how this can be possible in india reservatiin should be given but not on caste based.